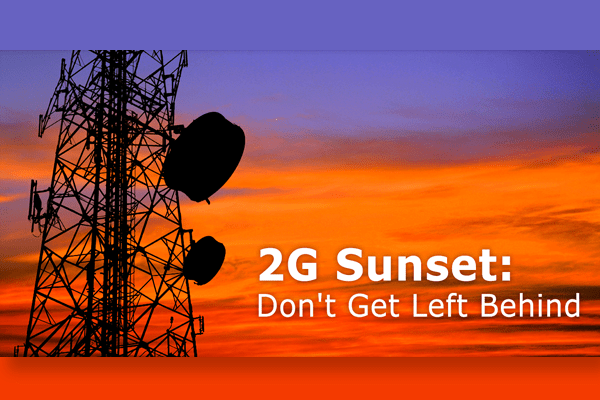 You might have already heard the buzz around the 2G sunset. In the article below, we try to answer some of the most common questions about the 2G sunset and what it means for fleet managers. Q: What is the 2G sunset? A: The demand for mobile broadband data has sky-rocketed with the increasing popularity of smart devices and M2M applications. According to AT&T, in the United States, “…data traffic has grown at a staggering rate since 2007, and will continue to increase dramatically in the foreseeable future.” Therefore, some cellular carriers are phasing out 2G to better respond to customer demand for enhanced services. Q: When will the shutdown of 2G start? Q: What are the advantages of 3G? A: The key advantages of later generations of cellular communications are enhancements in functionality and speed. All things considered, moving to 3G offers the benefits of upgraded hardware, access to advanced fleet management solutions, and widespread availability. Q: Why should fleet managers transition to 3G? Fleet Managers Hanging On To Their 2G Technology Will Get Left Behind. Q: How is Geotab helping customers with 2G hardware? A: Geotab is offering a special promotion to help customers with existing 2G hardware upgrade to new technology. Free hardware switch for Geotab devices operating on the KORE, Jasper and Aeris networks. Contact your sales rep or [email protected] to see if your devices qualify for this upgrade to take advantage of this limited time opportunity. Q: What are the advantages of the Geotab GO7 Device? A: The new Geotab GO7 devices have several advantages over the older hardware. Over the years we have increased the data we can collect from the vehicle, including seatbelt usage, richer engine diagnostic data, fluid level monitoring, and engine health monitoring through temperatures. The older devices do not have enough memory to run the newer firmware so this data is not available on the older hardware. G-force monitoring has also been improved; the GO7 takes more sensitive readings compared to early accelerometer in the GO5 devices. Most importantly, the GO7 has the ability to add-on additional solutions or sensors through the IOX.